LEAVES OF FIRE mass market paperback cover reveal. 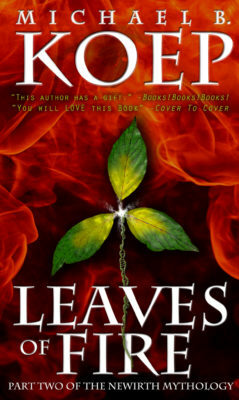 Will Dreamly Arts is pleased to present the forthcoming mass market paperback cover to Part Two of the Newirth Mythology: LEAVES OF FIRE by Michael B. Koep. The title is available for PREORDER now. It will release in the United States on July 23rd, 2017. Reviewers agree: a wholly original, imaginative, and remarkably inventive approach to the thriller genre. Intricately woven, this poetic page turner that will leave you haunted and wowed. Destined to be a classic. “A spiral into madness. This author has a gift!” – Books! Books! Books! Michael B. Koep is the author of the Newirth Mythology Trilogy. He is a father, a musician, a painter, swordsman, and getting better at baking bread. He lives in Idaho. Signing at Auntie’s Bookstore in Spokane.